Although the equator stretches 24,901 miles (40,075 kilometers) around the world, it travels through the territory of just 13 countries—and yet the landmasses of two of these countries do not touch the Earth's equator. The equator is an imaginary line that circles the Earth, splitting it into northern and southern hemispheres. Any location that lies along the equator is equidistant from the North and South Poles. The countries of Sao Tome and Principe, Gabon, Republic of the Congo, the Democratic Republic of the Congo, Uganda, Kenya, Somalia, Maldives, Indonesia, Kiribati, Ecuador, Colombia, and Brazil all lie along the equator. The landmasses of Maldives and Kiribati, however, do not touch the equator itself. Instead, the equator passes through water controlled by these two island countries. 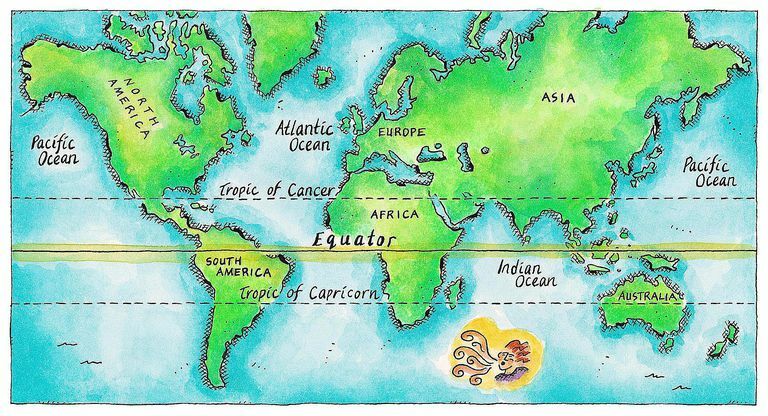 The equator is one of five lines of latitude that help provide relative locations on an atlas. The other four include the Arctic Circle, the Antarctic Circle, the Tropic of Cancer, and the Tropic of Capricorn. Because the Earth bulges at the center, the equator is significantly longer than any of the other lines of latitude. Along with the lines of longitude which run from pole to pole, they make it possible for cartographers and navigators to locate any spot on the globe. The plane of the equator passes through the sun at the March and September equinoxes. The sun appears to travel directly north to south over the equator at these times. Because of this, people living along the equator experience the quickest sunrises and sunsets as the sun travels perpendicular to the equator most of the year, with the length of days being almost entirely the same throughout—daylight lasting 14 minutes longer than nighttime. Most countries that lie along the equator experience much warmer temperatures year-round than other areas of the world that share the same elevation. That's because of the equator's near-constant exposure to the same levels of sun exposure regardless of the time of year. As a result, the countries that lie along the equators include almost half of the world's rainforest; they are concentrated in the African nations of Congo, Brazil, and Indonesia. Even so, the equator offers a surprisingly diverse climate due to the geographical features of countries that lie along it. There is little fluctuation in temperature throughout the year, though there may be dramatic differences in rainfall and humidity, which are determined by wind currents. In fact, the terms summer, fall, winter, and spring don't really apply to regions along the equator. Instead, people who live in the especially humid tropic regions refer to only two seasons: wet and dry. It's reasonable and largely accurate to assume that the weather is uniformly warm or hot around the equator. But of course, weather and climate relate not only to latitude but also to geography. Some countries that lie on the equator are flat and warm but others, like Ecuador, include high mountains where the weather is extremely cold. In fact, you will find snow and ice year-round on Cayambe, a volcano in Ecuador that reaches to 5,790 meters (nearly 19,000 feet). It is the only place on the equator where snow lies on the ground year-round.